Sports betting on the National Basketball Association is probably the second biggest gambling market in the United States of America after the NFL. The NBA is home to world famous teams like the New York Knicks, the Oklahoma City Thunders and the Los Angeles Lakers. 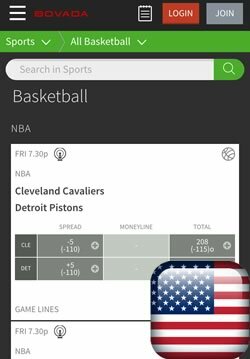 In this guide we look not only on the best U.S. friendly mobile bookmaker apps, but also at iPhone and Android apps for watching live NBA games and for helping you find winning betting tips. FanDuel is a real money daily fantasy platform that allows players to draft an NBA team and compete for big prizes each week. It is US-based as fantasy sports games are not considered gambling, but skill-based. This means players from almost all states can join the action. The rules are simple – just enter a contest and select a team made up of real NBA players for the selected match day. Based on the performance of each player you earn points and the user with most points wins. Usually, around 10% of the participants in each contest share the prize pool. There are lots of guaranteed tournaments where you can win huge prizes for a small entry fee. 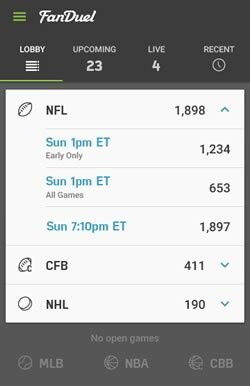 FanDuel made sure to provide their users with the perfect platform to manage their accounts and enter contests from their Android devices. The application supports all the important features. Simply log in and you will see the lobby. Select NBA to see all tournaments available. After that you can enter the one you prefer and draft your team. Another nice thing is that you can follow live scores of your players at any given moment. There are countless of different contests with entries starting from as little as $1. You can take advantage of the great FanDuel 100% first deposit bonus up to $200. There is also a loyalty program that rewards active users with tickets for freerolls every month. These are tournaments with no entry fee but with real money prizes. Bovada is one of the few bookmakers that accept US customers and allows them to bet with real money. Bovada are one of the biggest U.S. friendly sportsbooks, so it’s no surprise they are offering lots of markets on the NBA too. This applies to both pre-game and in-play options. The mobile bookmakers includes NBA, College Basketball, European and "Rest Of World" betting markets in its Android and iPhone versions. It has a smooth user interface that provides the perfect platform for wagering from your mobile device. From the Bovada app users can also access a wide range of useful betting data, including NBA defensive statistics, game logs, "Hot & Not" team statistics, plus articles and previews of upcoming NBA games. Bovada also has a very good 50% first deposit bonus up to $250 and they constantly offer different promotions to their users. The betting limits are good and the margin is competitive. Bovada have a reputations for facilitating fast payouts to sports bettors in the United States. You don’t need to install any applications as Bovada opted for a mobile responsive website instead. The Bovada sports betting apps works on virtually any type of Android, Windows Phone Lumia or iOS smartphone and tablet. The NBA has its dedicated Android application for each season and it is a must have for every fan and sports bettor out there. It provides loads of important data such as pregame stats, live scores, schedule, and much more. It also offers information on specific teams and individual stats on NBA players like points per game, rebounds per game and others. The app also allows you to watch various NBA videos and for a certain fee, you can get live video or audio coverage of NBA games. There are different subscription plans and you can choose between watching a single game or access to all matches for the whole season. 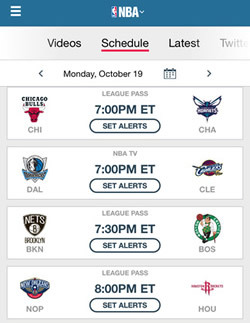 You can install the official NBA application directly from Google Play or from the iTunes App Store. This application is one of the best when it comes to odds comparison and valuable gambling information. It provides those for all American leagues and the NBA is no exception. You will find live odds from over 40 bookmakers, betting trends, latest injury news and more. ​SportsInsights also shows the betting volumes so you can understand where the public and shark money are going. 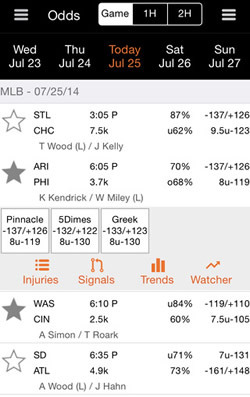 SportsInsights for iOS/Android is one of the best indicators of where to place your wagers. You can also see how the lines and odds have moved. ​The application is available for Android, you can find it in the Google Play app store. 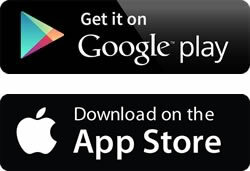 If you wager from an iPhone you can download the app for the Apple App Store and Windows Phone users have full access to their mobile site. The National Basketball Association (NBA) is without a doubt the most popular basketball competition in the world. There is a good reason why, as most of the best player in the world were always part of it. Local American stars like Stephen Curry, Lebron James, Kobe Bryant, Anthony Davis, James Harden and foreign talents such as Marc and Pau Gasol, Manu Ginobili, Luis Scola, Ricky Rubio and Tony Parker are part to the action. The competition is fierce and the NBA is one of the most popular leagues in the USA. However, it attracts fans from all over the globe. Teams like the Golden State Warriors, the Cleveland Cavaliers, the San Antonio Spurs are currently on top of the league and have growing fan bases. However, legendary teams as the Chicago Bulls, the New York Knicks, the Phoenix Suns, the LA Lakers, the Boston Celtics traditionally attract lots of basketball lovers from all over the world. The high global interest also attracts lots of betting action. The NBA is one of the competitions with highest wager volume on the planet. It is popular amongst US-based sports bettors, but also in Europe, South America, and Asia. This is the reason all gambling operators out there are offering plenty of odds and promotions on NBA games. There are traditional spread and money line markets, but also a variety of prop and side bets. With all that attention to the competition, it is no surprise there are a number of useful mobile applications for Android, Microsoft Lumia and iOS devices. They help bettors place their wagers, get useful information and even watch games live from their phone or tablet. Here is a list of the most important Android apps for NBA betting.